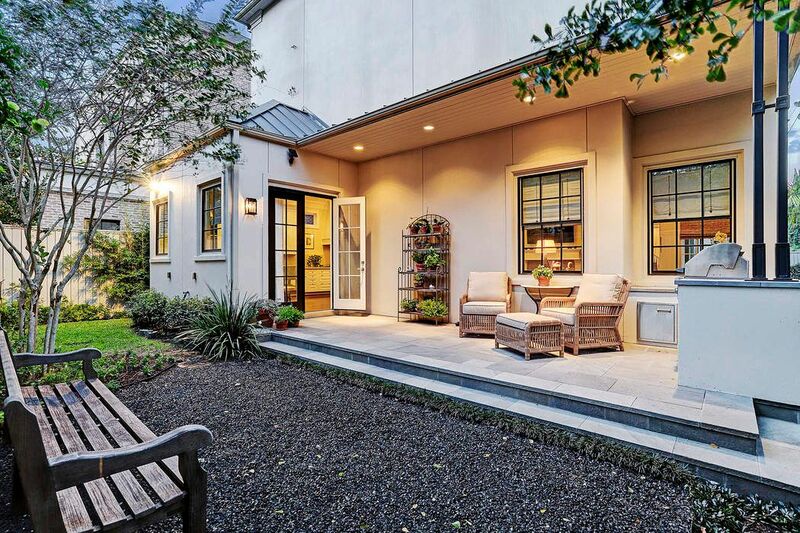 31 Broad Oaks Estates Lane, Houston, TX 77056 | Martha Turner Sotheby's International Realty, Inc.
[Patio] Inviting side and rear patios have slate hardscape. The rear patio includes a gas cook center with abundant counter space and storage. There is also a full-house generator with buried cables. [Kitchen]View across the kitchen island into the breakfast alcove. 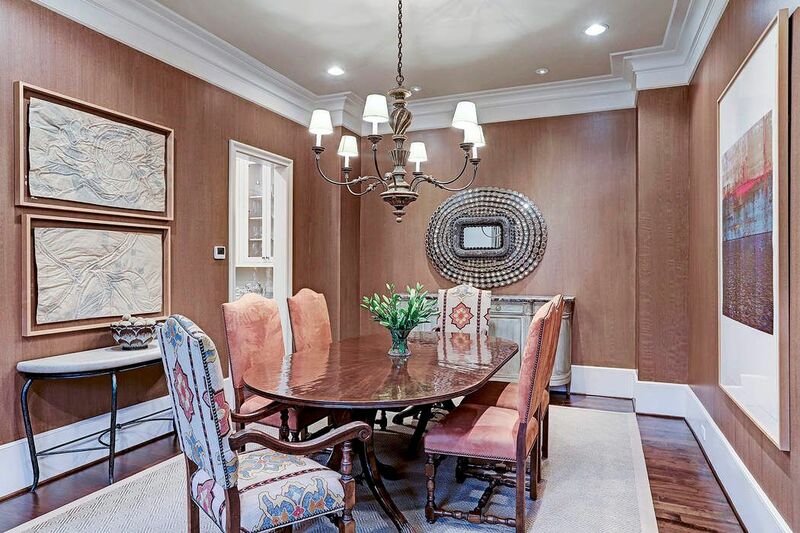 Note paneling and French doors in breakfast alcove. 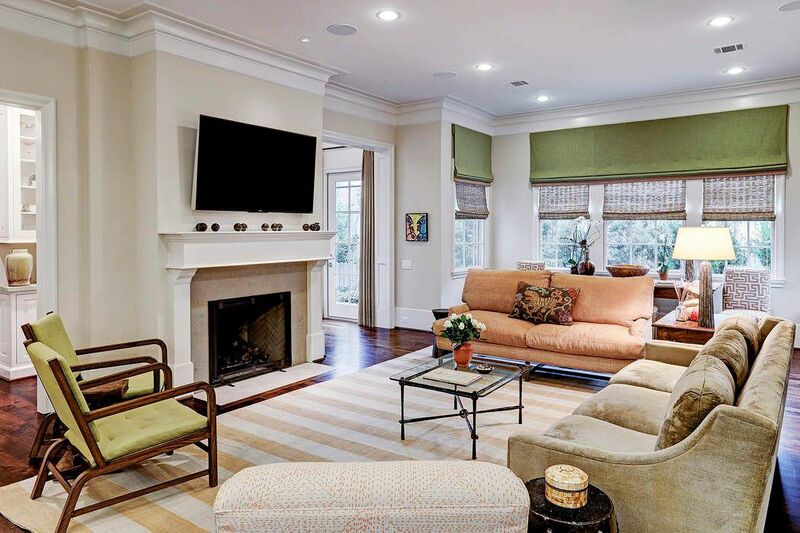 [Living Room]The open gathering space of the living room is ideal for entertaining. 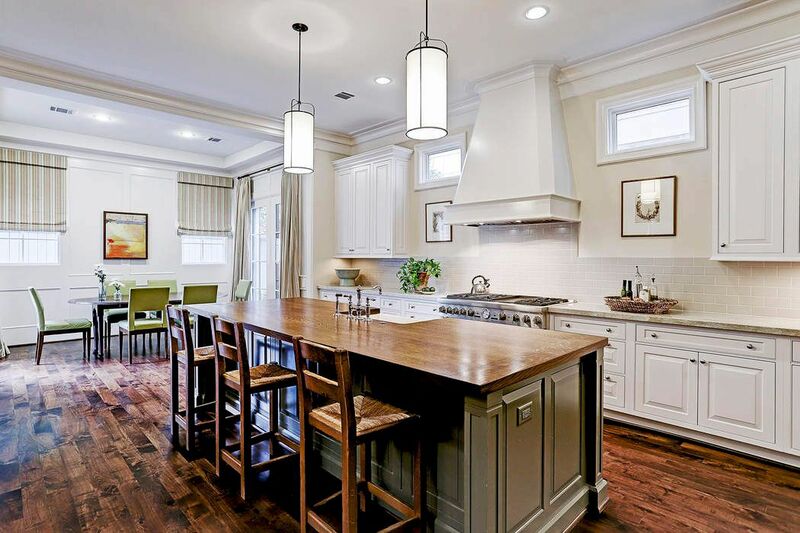 A closer view reveals the walnut floor and the kitchen island s rich cabinetry. [Living Room]Another view of the living room reveals the breakfast alcove and large kitchen island with pull-up seating. [Living Room] A closer view of the living room fireplace with television mount in the over mantel. Opening into the butler's pantry/bar is shown at left. Note surrounding windows with views of the garden. 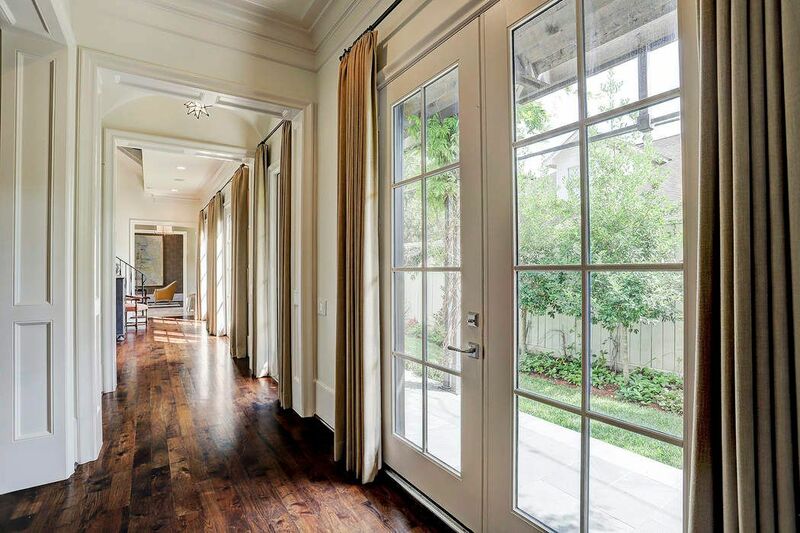 [Living Room 23 x 20]Gathering spaces at the rear are framed by French doors and banks of windows. 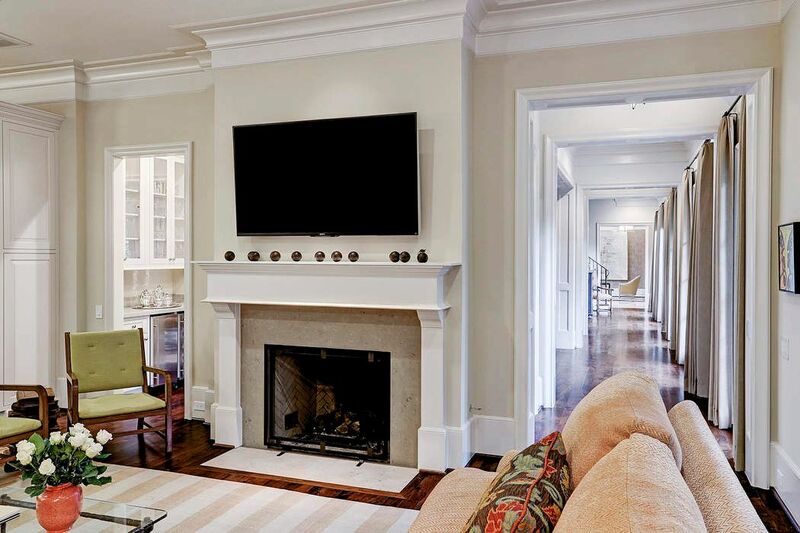 The spacious, inviting living room is arranged around a fireplace. [Living Room]Windows in a corner of the living room overlook the gardens. Note custom shades. 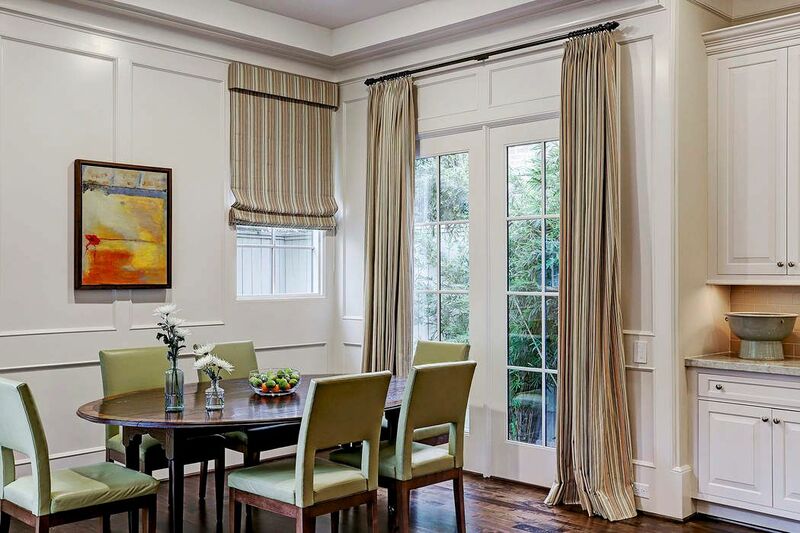 [Breakfast Alcove]Open to the kitchen and living room, the richly-paneled breakfast alcove has French doors to the patio and gardens. 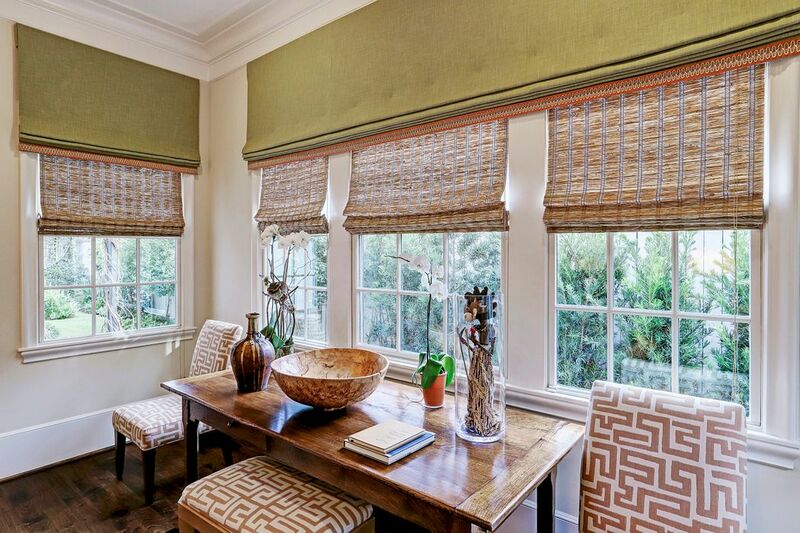 [Dining Room 14 x 13] Hand-painted and combed walls by artist Glenn Miracle adds texture and dramatic ambiance to the dining room. 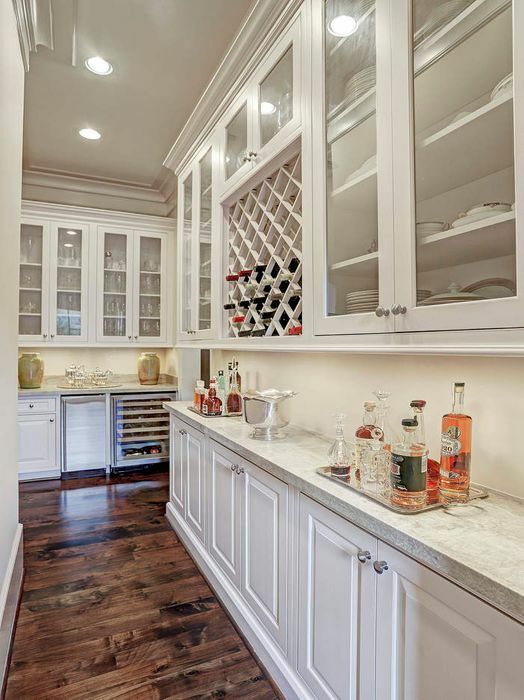 [Butler s Pantry/ Dry Bar]Light-filled butler's pantry connects the dining room to the kitchen, and has open access to the gallery. 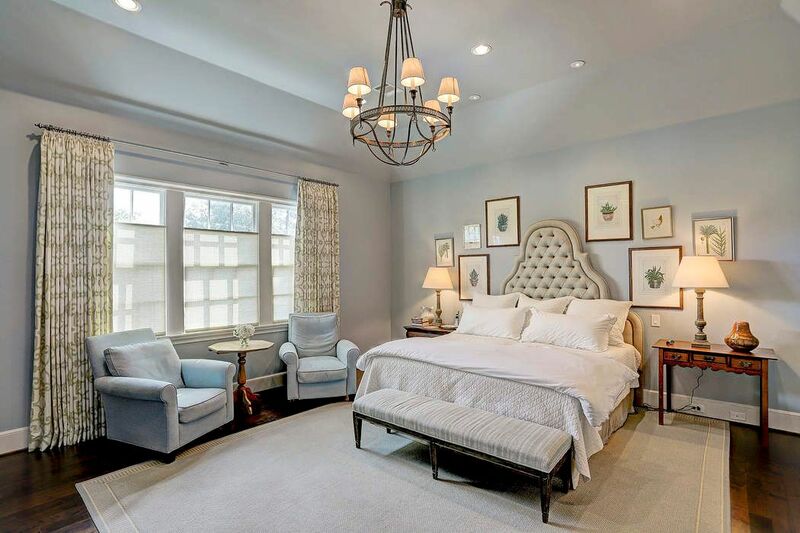 [Master Suite 18 x 17]The expansive master suite achieves a rare degree of luxury with a sitting area, fireplace and book/display cases. 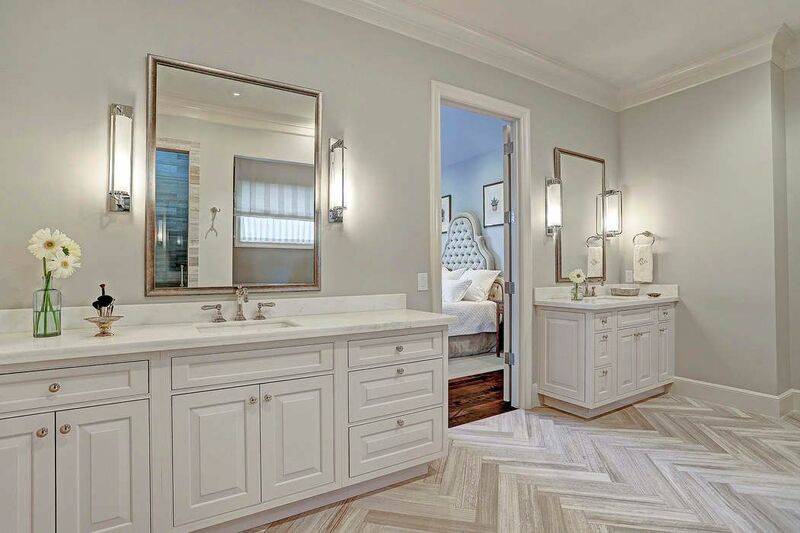 [Master Bathroom]Spa-inspired bathroom appointed with a chevron-pattern marble floor, quartzite sink and vanity decks, a Koehler soaking tub, seamless glass entry shower, an enclosed water closet, and soft-close drawers. 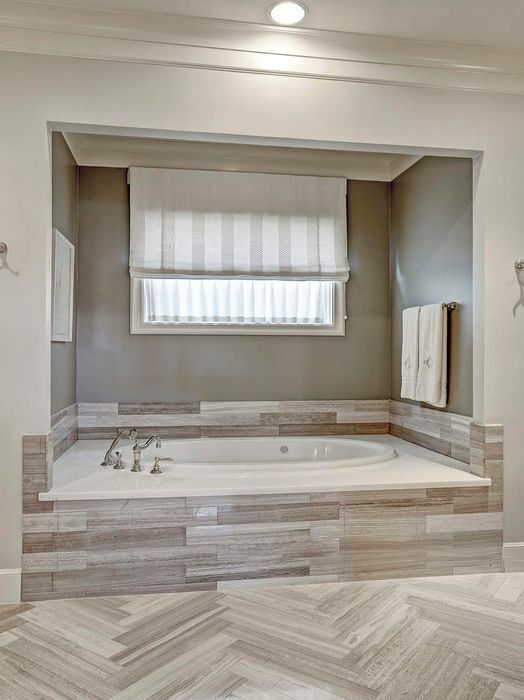 [Master Bathroom]Koehler Soaking tub with marble deck and surround. 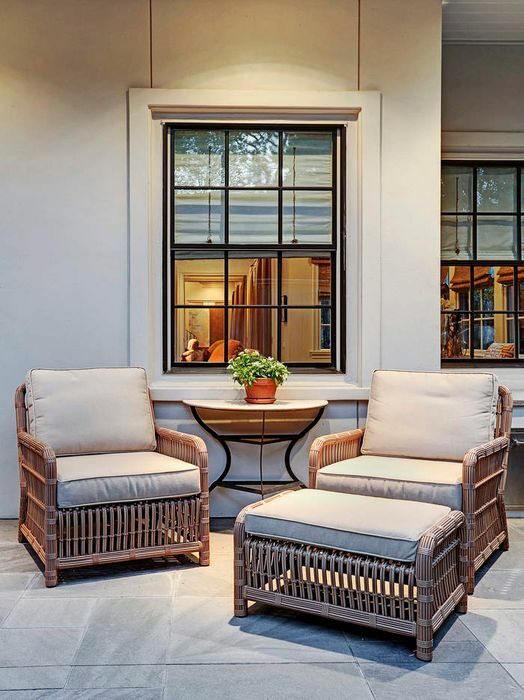 [Gallery / Gardens]French doors line the gallery and provide views of the seasonally-blooming gardens, statuary, and antique bird bath. 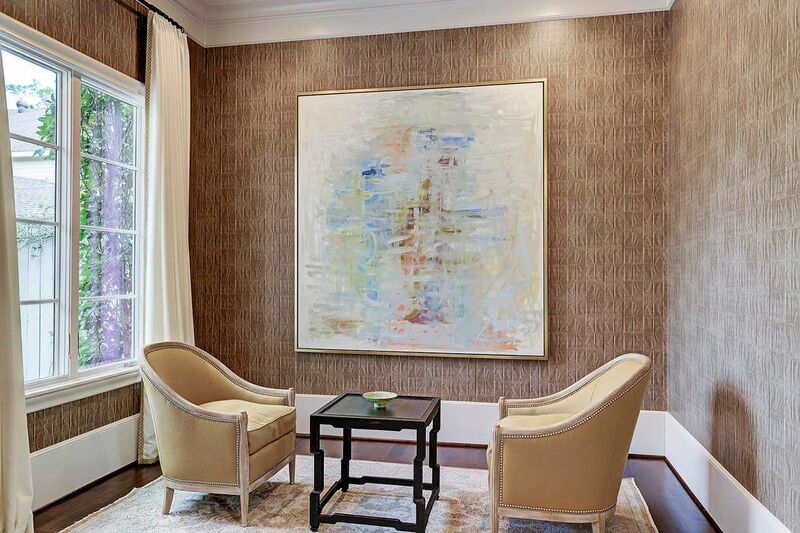 [Foyer / Reception Area]The foyer / reception area is an excellent location for art display. [Gallery/Reception]A view down the gallery to the foyer and reception area. 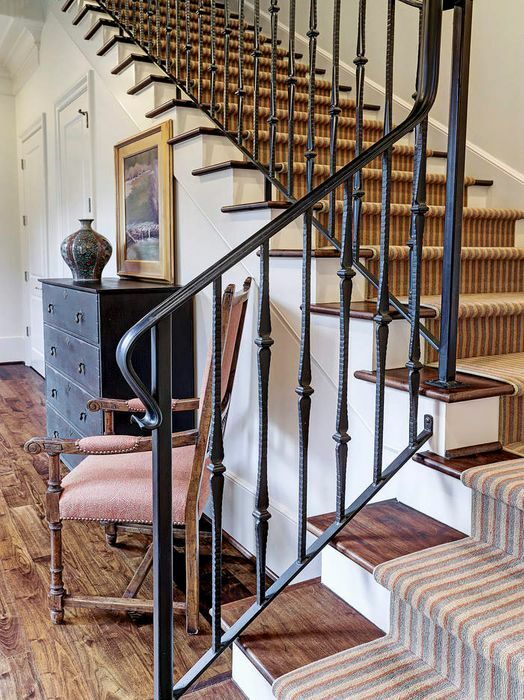 Note walnut floor in gallery and custom-designed wrought iron balustrade. [Reception Area]Adjacent to the foyer and entry, the reception area has trompe l oeil wallpaper that mimics the look of folded fabric. 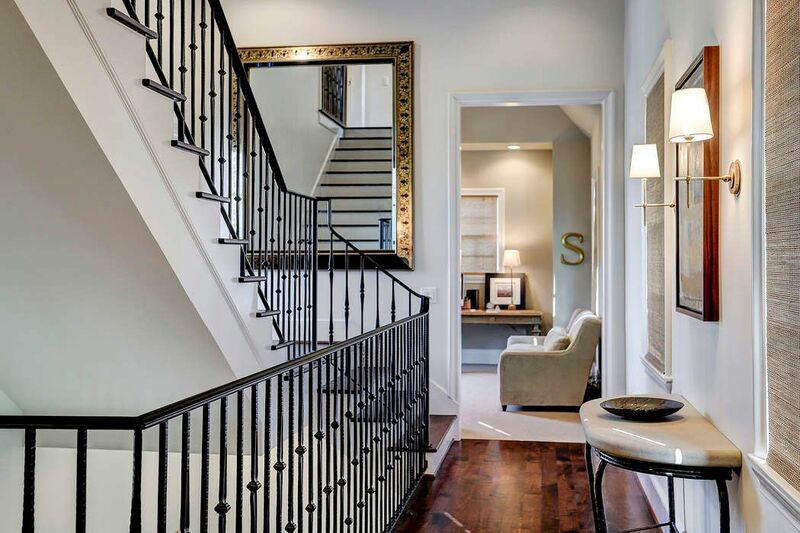 [Staircase] A close view of the staircase focuses on the custom-designed wrought iron balustrade and the custom-designed runner. 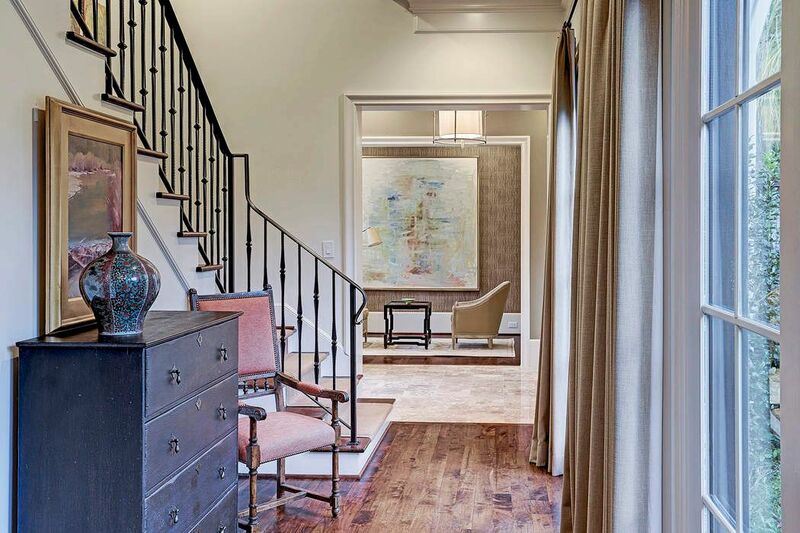 [Staircase Landing/ Home Office]View from the second-floor landing into the inviting home office. 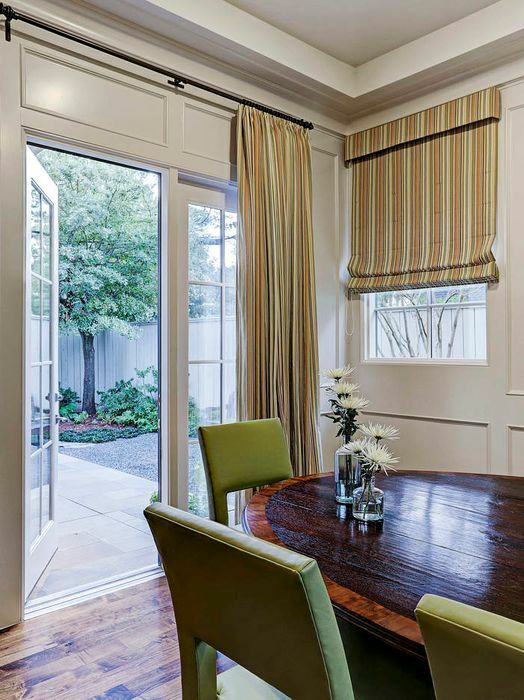 [Breakfast Alcove]A closer view of the breakfast alcove reveals the opened French door to the rear patio. [Patio]Detail of the rear patio with stone hardscape. Windows offer a view into the living room. 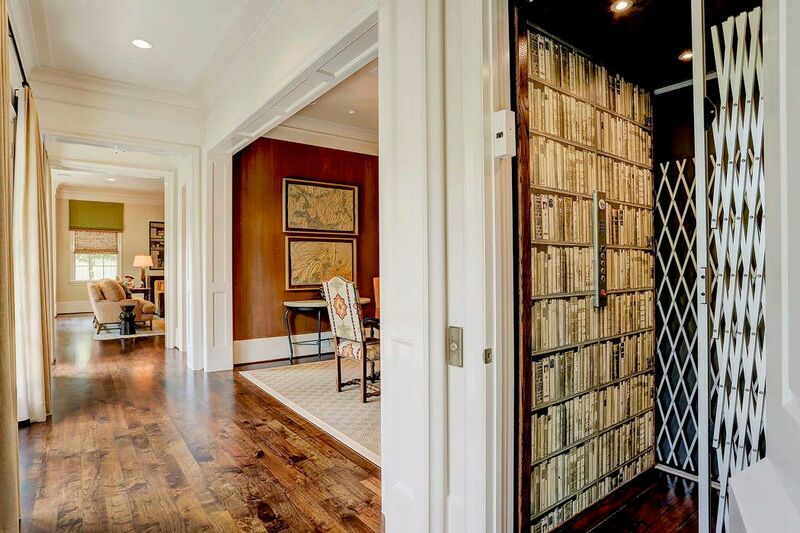 [Elevator]Custom-designed elevator has biblioteque wallpaper and hardwood floor. 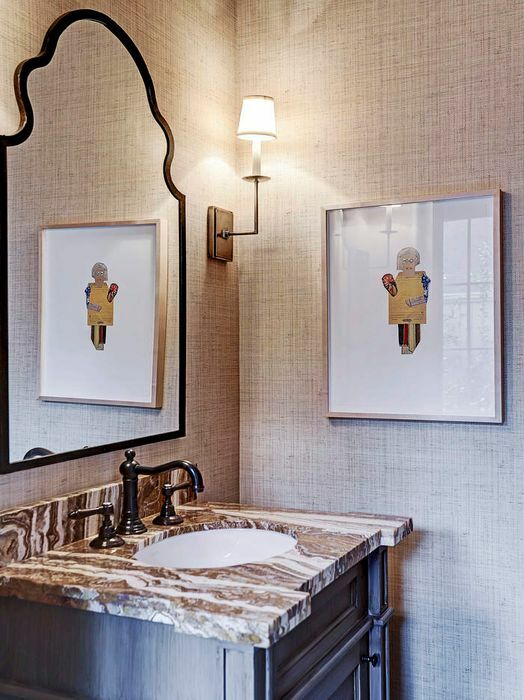 [Powder Room]A magnificent cut-onyx sink deck enhances the powder room. [Secondary Bedroom]Located on the second floor, this secondary bedroom has plush carpet, a custom-fitted walk-in closet, and a luxurious en suite bathroom. 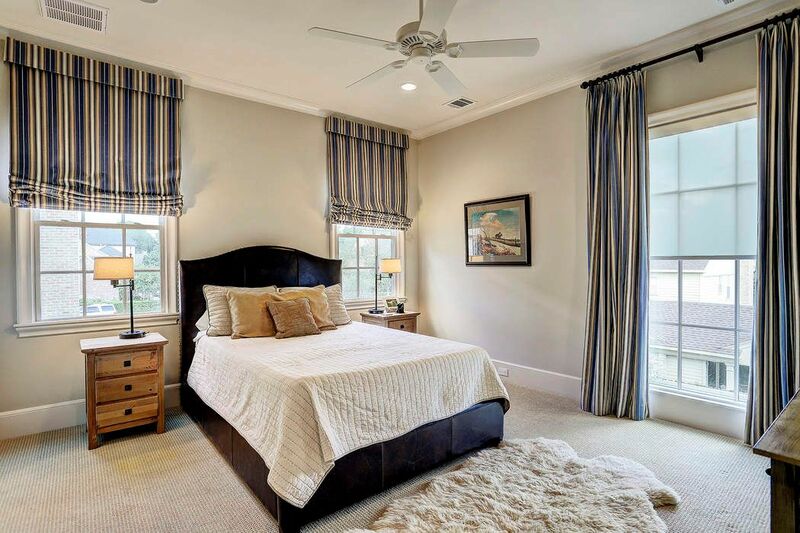 [Secondary Bedroom/Second Floor]This bedroom also offers a custom-fitted walk-in closet and luxurious en suite bathroom. [En Suite Bathroom]One of the en suite bathrooms. 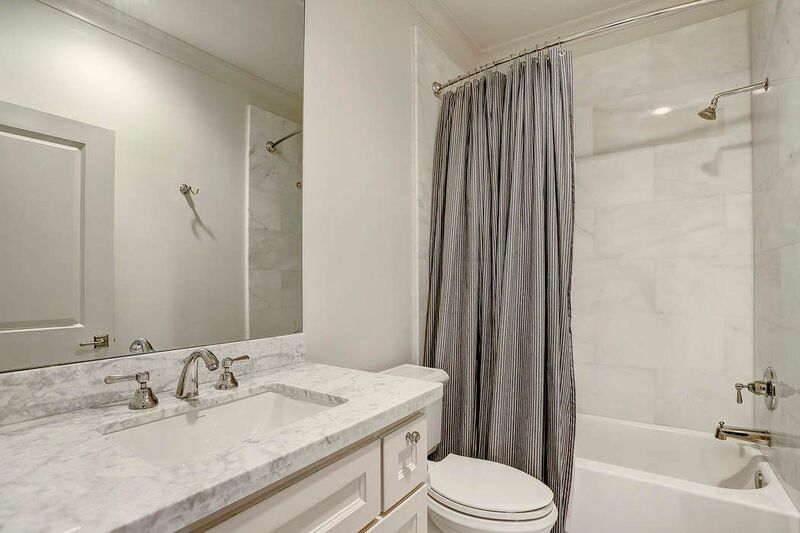 Note marble surfaces. 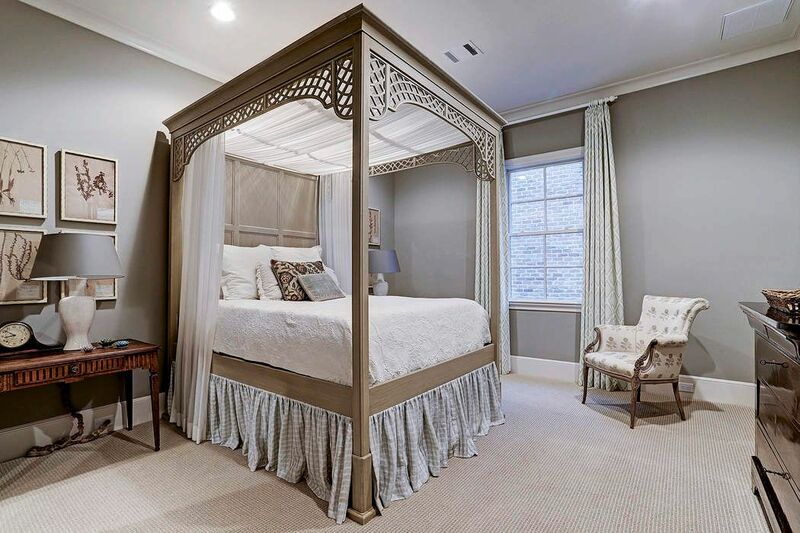 [Secondary Bedroom/ Third Floor]This secondary bedroom on the third floor features a window seat, custom-fitted walk-in closet, and a luxurious bathroom. 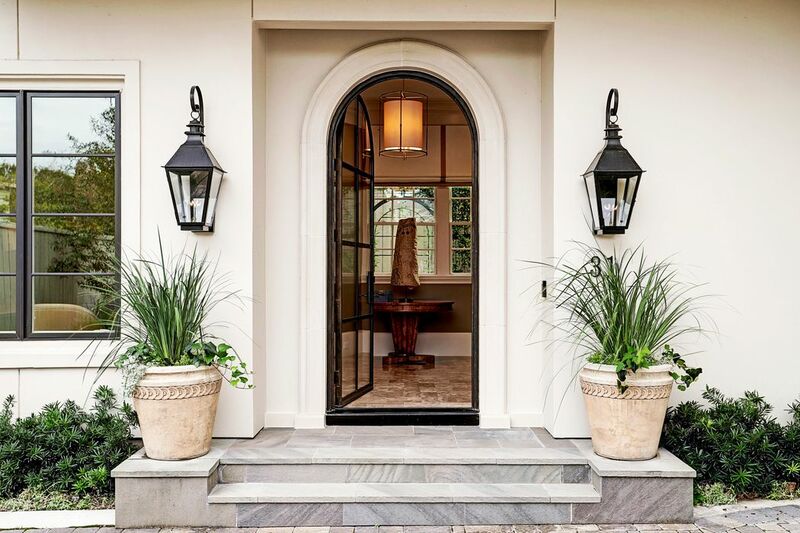 [Front Entrance] A tall arched commercial-grade glass-and-steel front door swings open into the welcoming foyer. 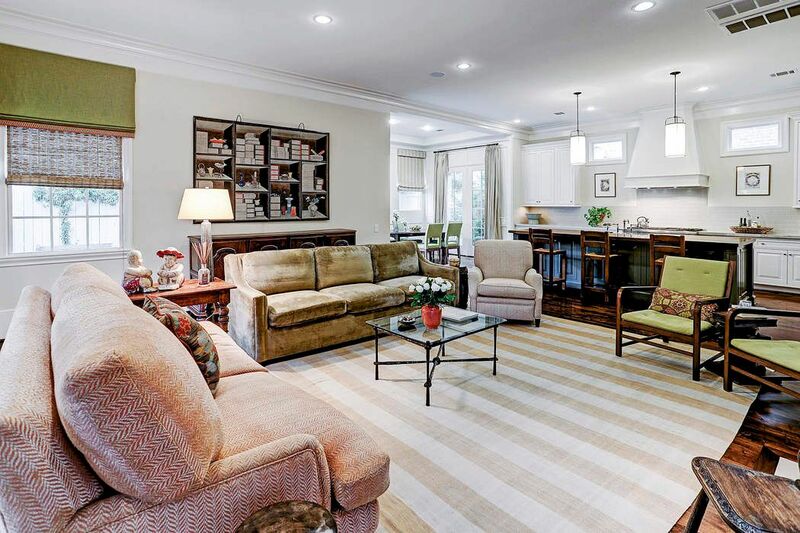 $1,699,000 4 Bedrooms4 Full / 1 Partial Baths5,686 sq. 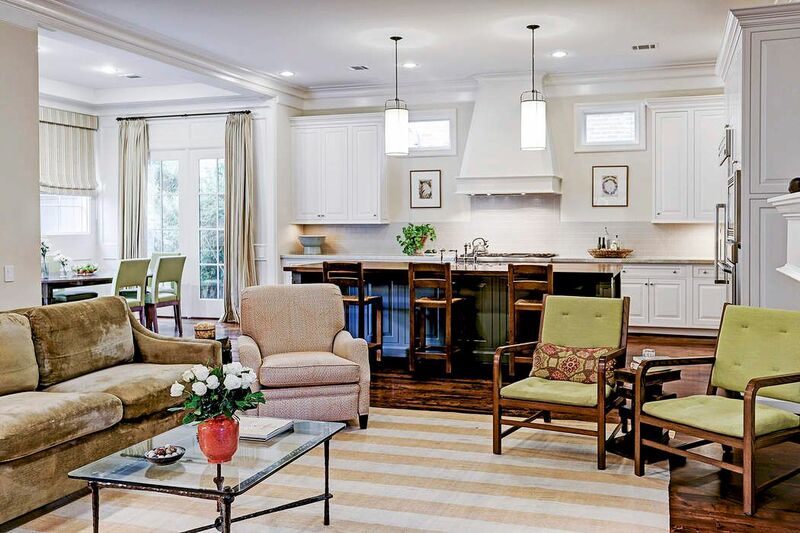 ft.
Exceptionally refined, light-filled home with interiors designed by Wells Design/ Jerry Jeanmard. 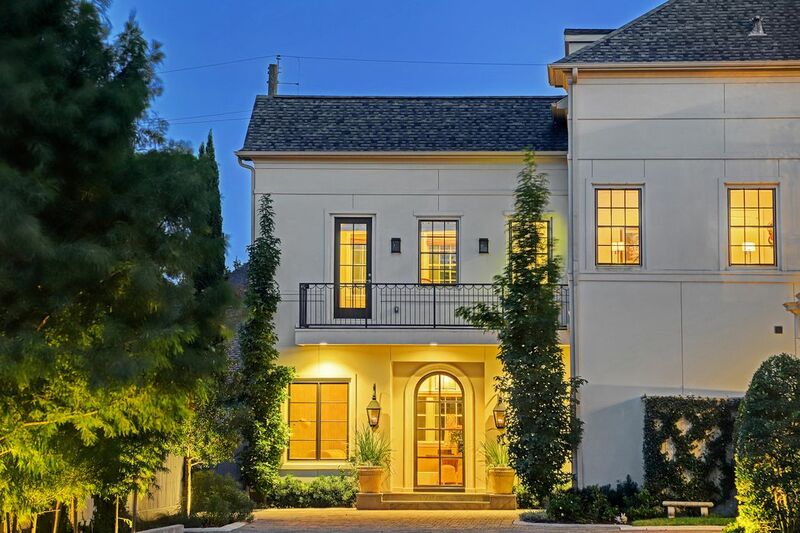 Located in a private, gated community this free-standing home has sophistication paired with remarkable livability. 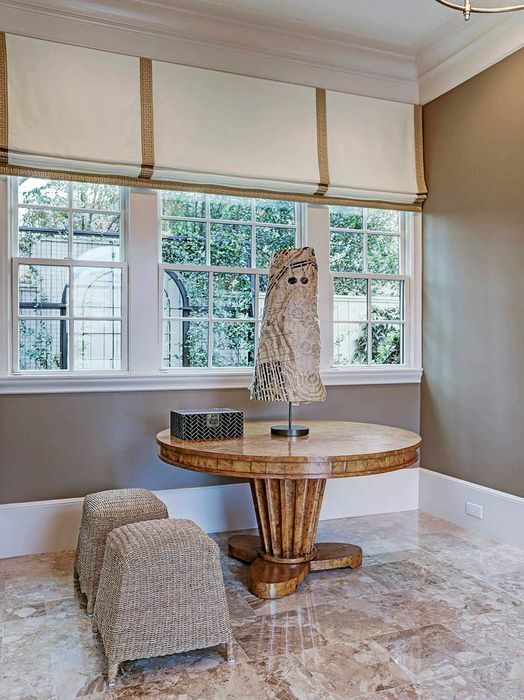 Marble and walnut floors, 10 - 12-ft ceilings, custom wall and window treatments are just a few of the many amenities. 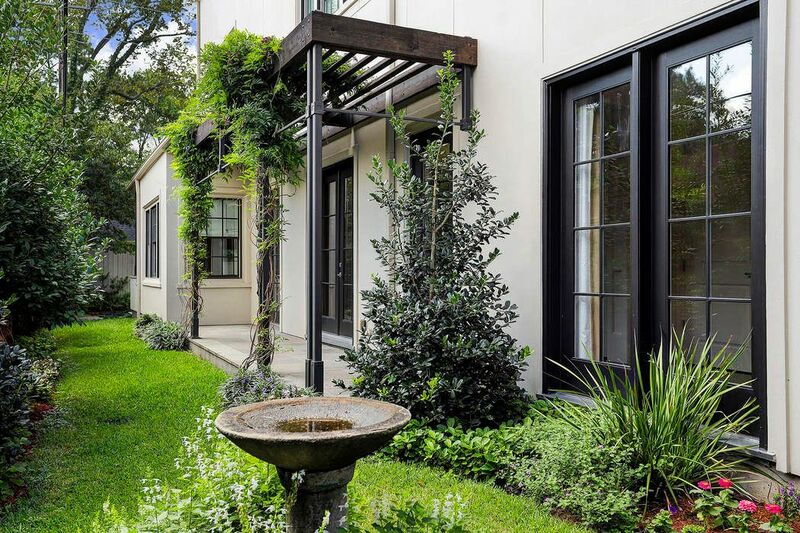 It has an open floor plan with gallery, and the kitchen, breakfast room, and den overlook the patio and gardens. 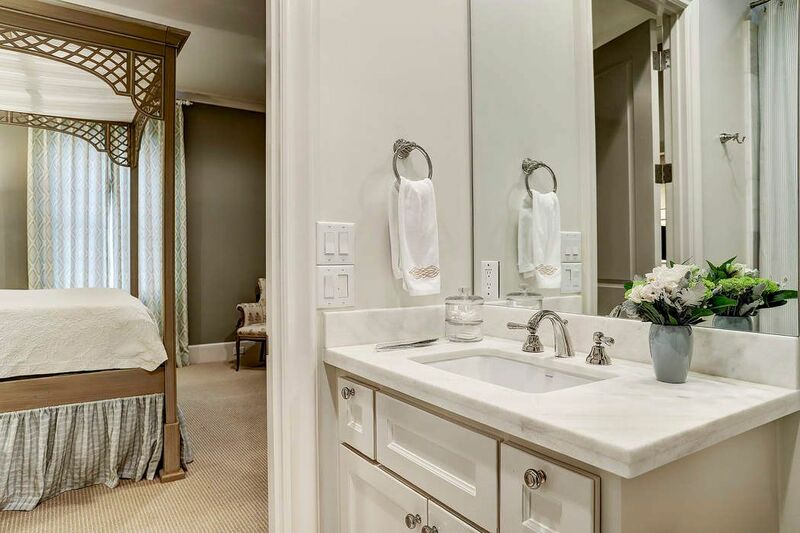 Sumptuous master suite with bespoke dressing room and closet, and a lavish marble-clad bath. En suite bedrooms, home office, 3rd floor with full bath and game room. Elevator.